UNEARTHING THE LOST WORLD OF THE CLOUDEATERS is a book unlike any other, one that demands the Smithsonian to open its hidden warehouses so the history of ancient America can be rewritten! As chronicled by Dr. Thomas R. Horn, radio legend Stephen Quayle, and two teams of investigators and film crews (following a secret conference with leaders of the Ute Nation, Zuni, and Hopi tribes) the most compelling evidence is finally unveiled involving pre-Columbian, dragon/giant-worshiping interlopers who traversed the Atlantic Ocean and secret Anasazi routes to corrupt the earliest Americans with portal-opening sorcery, human sacrifices, ritual cannibalism, and technology of the fallen ones. 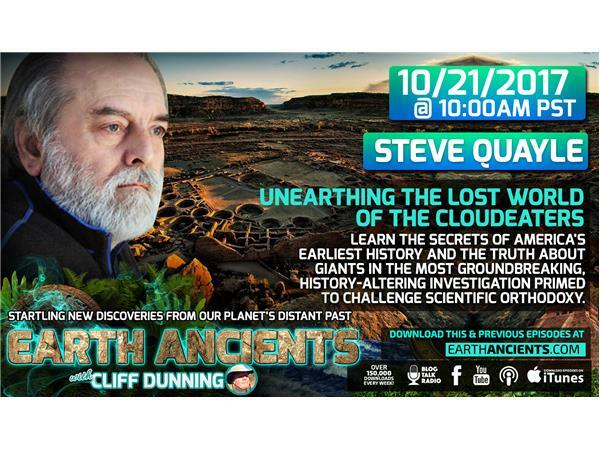 NOW, FOR THE FIRST TIME, IN UNEARTHING THE LOST WORLD OF THE CLOUDEATERS: DISCLOSED! The truth behind the great Smithsonian cover up REVEALED! The pre-Flood architecture of the Giant Kings DECIPHERED! Pre-Flood angel civilizations and the remnants of Watchers UNCOVERED! The secret of the Anasazi and why they disappeared overnight UNVEILED! Ancient hidden stargates that medicine-men still use to see the future CONFESSED! The sacred mountains where the giant bones are kept EXPOSED! What tribal elders confessed about returning giants UNMASKED! Giant, cannibalistic gods that demanded human sacrifice DISCOVERED! Children of Cloudeaters, six-fingered, six-toed mutants UNWRAPPED! Shapeshifters, Skinwalkers, and other sky people UNEARTHED! Stephen Quayle is the author of five books. For over thirty years, he has been investigating ancient civilizations, giants, UFOs and biological warfare as they relate to the future of mankind. Stephen discusses the coming worst-case scenarios approaching this world and how they interrelate to each other. Earthquakes, volcanoes, nuclear and biological terrorism, coupled with the planned financial meltdown of the U.S. dollar will thrust us into unimagined tribulations.